Clare Hollingworth, Reporter Who Broke The Story Of Start Of WWII, Dies At 105 : The Two-Way As an activist, Clare Hollingworth saved thousands of refugees from Hitler's forces. Then, a few days into her career as a reporter, she uncovered the scoop of a lifetime: Germany was invading Poland. 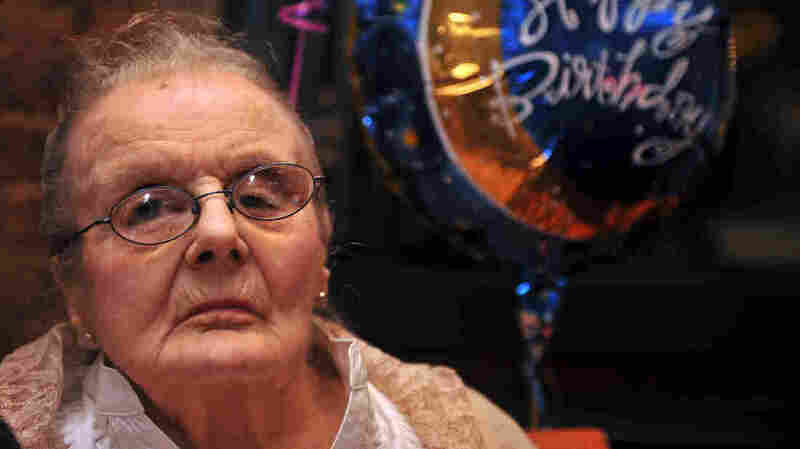 Veteran British war correspondent Clare Hollingworth, who broke the story that the World War II had begun, celebrates her 100 birthday during a party at the Foreign Correspondents' Club in Hong Kong in 2011. She celebrated her 105th birthday there this past October. Clare Hollingworth, the war correspondent who told the world of the outbreak of World War II, has died at 105. She died Tuesday evening in Hong Kong, according to long-time friend Cathy Hilborn Feng, who says Hollingworth "had a smile before she left us." Hollingworth was a rookie reporter when she landed the scoop of a century — she had been a journalist for the Daily Telegraph for less than week when she revealed German tanks were gathered at the Polish border, poised for an invasion. It was the start of an illustrious career in journalism that lasted some seven decades. The "doyenne of war correspondents" lived the last few decades of her life in Hong Kong, where she was a regular at the Foreign Correspondents' Club. The club mourned her death on Tuesday, with President Tara Joseph calling her a "tremendous inspiration." Before her career as a journalist began, Clare Hollingworth helped thousands of political refugees fleeing Hitler's forces to gain asylum in Britain. "In 1938, a year before war was declared, thousands of refugees were flooding across borders looking for asylum. "In response, Clare Hollingworth, a glamorous 27-year-old political activist from Leicester, booked a Christmas holiday to Kitzbühel in Austria. "She visited the well-heeled ski-resort in December 1938 to carry out reconnaissance, and returned to the UK with a Nazi-approved visa in her passport." With her visa in hand, Hollingworth could travel into Poland to provide aid to fleeing Jews, unionists and writers. Many of the refugees lacked documents and were in danger of being sent back into Nazi territory. Hollingworth's grand-nephew Patrick Garrett, who wrote a biography of his great aunt, wrote in the Telegraph that she used her "noted pushiness and ability for wrangling with officials, skills that would later stand her in very good stead as a foreign correspondent," to get the refugees papers, food, money and tickets to the U.K.
She helped thousands of refugees reach Britain, Time reports, and the British press dubbed her "The Scarlet Pimpernel" for her efforts. But the British government suspected she was letting in "potential spies," including communists. They put an end to her efforts in the summer of 1939. Back in London and looking for a new job, Hollingworth persuaded the Daily Telegraph to send her back to Poland as a reporter. "Knowing that war may be imminent, and bolstered by the presence of a diplomatic flag, she borrowed her host's car, and 'motored off alone into Nazi Germany' to stock up on wine and aspirin. As she drove back along the border, a fabric partition separating the two countries flapped momentarily in the wind, exposing 'scores, if not hundreds of tanks' in the valley below. And there was her first big scoop: the outbreak of World War II." Her headline in the Daily Telegraph: "1,000 Tanks Massed on Polish Frontier; 10 Divisions Reported Ready For Swift Stroke; From Our Own Correspondent." There were actually only nine divisions, Garrett notes — but "not bad" for her first week on the job. Three days later, the invasion began. Hollingworth called both her editor and the British Embassy to alert them. The Guardian reports that the embassy staff didn't believe her — so she held the telephone receiver out the window so they could hear the attack for themselves. It was a stunning start to an extraordinary career. Hollingworth continued to report for the next seven decades, from all over war-torn Europe, then from north Africa and communist China and Palestine and Iraq and Vietnam, among other places. Colleagues particularly admired her work on the perilous, complicated Algerian War in the '50s and '60s, both Time and the Guardian write. She also uncovered a famous scoop related to Kim Philby, the "third man" of Britain's notorious "Cambridge Five" group of Soviet spies. At a time when the British government was insisting Philby was not the spy in question, she discovered evidence suggesting he had quickly and covertly escaped to Russia. The scoop was so stunning that an editor at the Guardian refused to run it, fearing libel suits. Weeks later, she persuaded a deputy editor to run the item on page 7. "Shortly afterwards the government admitted it believed Philby had indeed fled to Russia," the Guardian writes. Hollingworth was a famously hard worker, obsessive and seemingly tireless. She loved covering war and conflict — one colleague told the Guardian that Hollingworth "actually enjoys war. She's not at all bloodthirsty, she's actually very humane and kind, but she gets a huge kick out of it." "I enjoy action," Hollingworth told the BBC. "I enjoy being in a plane that's bombing something, or being on the ground in the desert when they're advancing." "She was always in the right place at the right time," John Simpson, world affairs editor at the BBC, said in a video produced for Hollingworth's 104th birthday. "Who did the first interview with the shah of Iran? Clare Hollingworth. Who did the last interview ... after he fell? Clare Hollingworth." She later became a Beijing-based correspondent for The Telegraph. In her early 90s, living a quieter life in Hong Kong, Hollingworth told the Guardian that she still didn't consider herself retired; she called in regularly to the London newsdesk. Toward the end of her life, most of her life savings were stolen by a fellow expat in Hong Kong, as the Telegraph reported at the time. But her grand-nephew and biographer says she was able to maintain her "independent lifestyle in Hong Kong, closer to her beloved Foreign Correspondents' Club." At her 105th birthday this past October, she was feted at the club by admiring journalists and friends. She also received a long-distance message from Margo Stanyer, who had fled Hungary as a 4-year-old in 1939. As the BBC reports, Hollingworth had helped Margo and her family arrange visas and travel to London. Some 77 years later, Stanyer, an 81-year-old great-grandmother, recorded a video message for Hollingworth. "Thank you to Clare, again and again and again. I think of you a lot, until the end of my life," she said, tearing up. "Wish you all the best. Live for a hundred years again."